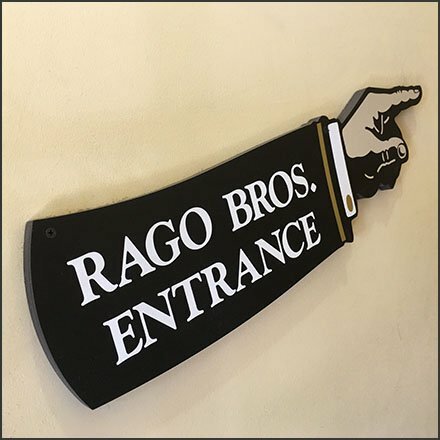 The pointing hand in this Rago Bros Index Vintage Directional Sign is actually referred to as an “index.” And it points the way up a short flight of stairs to the shop itself from the parking in the rear. Free nonetheless, and a nice benefit to a busy in-town location. The sign ties nicely to other vintage posters, visual merchandising, and signage throughout the shop. This Rago Bros Index Vintage Directional Sign but one of many intriguing items at the famous Morristown location.